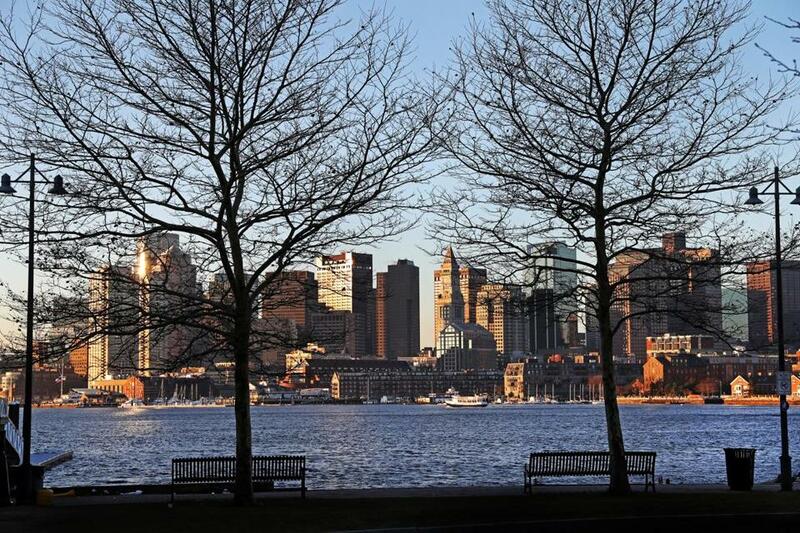 A skyline view of Boston in the early morning seen from East Boston. The NAACP, one of the nation’s oldest and most prominent civil rights organizations, announced Monday it will hold its 2020 convention in Boston, a remarkable public relations victory for a city still reconciling its racist past. The convention will bring thousands of NAACP members to Boston and provide city leaders an opportunity to showcase what Mayor Martin J. Walsh sees as racial progress in the city. The organization’s Boston branch said in a statement that it was honored to serve as host. The site of the convention was not revealed. The NAACP’s announcement follows the news last week that a fund-raising committee, working with the city, finalized plans for a new memorial to be built in honor of Martin Luther King Jr. and his wife, Coretta Scott King, on Boston Common. Walsh first disclosed in his State of the City speech in January that the city was a finalist for the 2020 convention. He said then that the decision reflected the city’s efforts to improve equality for all Bostonians. “We are changing Boston’s culture for the better,” the mayor said in his speech. The last time the NAACP held a convention in Boston was in 1982, at a time of heightened racial tensions in the city. The group says its objectives are to ensure political, educational, social, and economic equality for all; to confront discrimination and race prejudice; and to preserve and protect civil rights through the enforcement of state and federal laws. The message could have resonance in Boston, a city that still labors to heal the wounds of its past, from its role in the center in the slave trade in the 17th and 18th centuries, through the violence of busing and school desegregation in the 1970s. Last year, the Red Sox’ effort to rename the street by Fenway Park that was named in honor of Tom Yawkey, the late owner of the team who had a reputation as a racist, divided the city. Many in Boston’s black community supported the name change, putting them at odds with many who said the city should keep the street name and instead celebrate Yawkey’s legacy as a philanthropist. John Henry, the majority owner of the Red Sox, also owns The Boston Globe. In 2017, the Globe’s Spotlight team documented a historic pattern of systemic racism in Boston that has left most of the city’s black residents out of powerful political and business circles. The Walsh administration has also had a mixed relationship with the NAACP’s Boston chapter. In 2017, when Walsh was seeking reelection, the local branch gave him poor grades — includes Fs and Ds — for his efforts to improve racial equality and diversify city government. In January, Walsh vowed that the city was working to make Boston “a more resilient city.” The city, he said, has reactivated a Human Rights Commission. And the mayor recently signed an order requiring all city workers to undergo training to recognize inequality across all government services. Walsh said the city has made progress in electing black residents to high political posts, noting the city has its first black district attorney (Rachael Rollins), black police commissioner (William Gross), and black sheriff (Steve Tompkins). Voters also sent Ayanna Pressley to Congress, ousting long-term incumbent Michael Capuano. “We put social justice at the heart of our vision because a more equal conversation means a more resilient city,” Walsh said.